The Silent Mini Multi Display PC (MMDPC) consists of a Sapphire Tech FS-FP5V motherboard with a AMD Ryzen V1605B Embedded APU, all housed in a tiny 100% fanless full aluminium chassis! Tranquil's industrial and completely fanless chassis is optimised for efficient cooling and durability. This system is designed to withstand both industrial and environmental hazards. 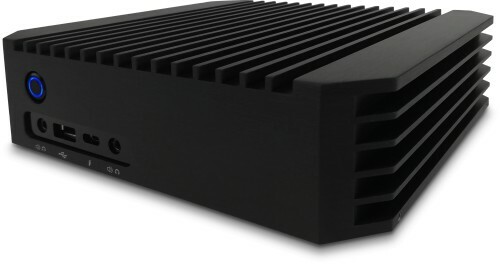 The proficiency of the fanless design means it is protected from dust, floating debris, and moisture that would naturally damage a typical industrial mini PC. With the elimination of the fan and the use of solid-state drives, there are no moving parts in the system allowing for a silent operation service, a significantly improved start up speed, and resistance to vibrations and shocks, allowing for a longer expected lifespan. The Mini Multi display PC provides powerful performance thanks to the supplied embedded AMD Ryzen APU in the Sapphire Tech motherboard. The FS-FP5V motherboard incorporates an AMD Ryzen V1605B APU (Advanced Processing Unit) which features four cores and eight threads running at a base speed of 2.0GHz and a up to 3.6GHz turbo speed. A maximum of 32GB of SODIMM memory can be installed as well as a single M.2 SSD from 120GB to 2Tb, allowing for optimum enhancements. Furthermore, AMD APU features a Radeon Vega 8 graphics with a maximum memory share of 2048MB which gives good performance if it is intended to use the PC for light gaming. During our evaluation of the Mini PC we tested to make sure it would be able to connect to four 4K monitors that output a resolution of 3840 x 2160 each. We are delighted to say the Mini PC passed this with flying colours. So if you are looking for a small PC that can output a total resolution of 15,360 x 8640 via four monitors then this PC is the answer! Tranquil PC Full Aluminium Fanless Chassis ? Tranquil PC Dual Band Wireless-AC 7265 802.11ac Wi-Fi and Bluetooth kit ? Quiet PC DisplayPort 1m Cable with Locking Connector ? Quiet PC DisplayPort 2m Cable with Locking Connector ?